Many of us can remember when the Radio Wooster sports department consisted of Ken Nemeth or maybe Nemth with Mel Riebe, or Nemeth with Bob Heeter. In those days, we listened to a few high school games, a few college games and thought we were doing OK. Nemeth, however, had a dream that more could be done in the way of local sports programming. The result is a station which has received many AP and UPI awards for various aspects of “Sports Programming”. Today the station carries all of the Cleveland Indians, Browns, and Cavalier games, the Ohio State football and basketball games, and the College of Wooster football, basketball, and baseball games. In addition, local high school football, basketball (boys and girls), softball, and baseball games are covered as well, including sectional, district, and state tournaments. None of this has happened by accident of course. 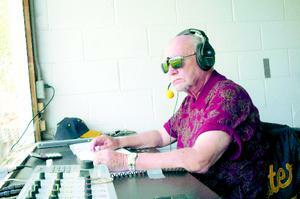 Nemeth graduated from Coventry High School in 1956, with a burning desire to become a sports announcer. (He had done some make-believe broadcasts in his bedroom while in high school to practice his skills). He did a little play-by-play of Akron area games on a part time basis and also ran a TV camera at WAKR, also part time. Soon he landed a job on the Beacon Journal staff ad got some experience in journalism. In 1960, Nemeth sent his resume out to many radio stations, in hope of getting into radio, finally. He was hired by Radio Wooster (WWST AM/FM) as a disc jockey. Nemeth started attending local games with a good friend, Jim Byrd, and did his first football game at Wooster High. The coverage expanded and more games were added to the schedule. In 1962, he became Sports Director and was able to add even more to the schedule. In 1966, the entire state boys’ basketball tournament in Columbus was put on the schedule, and still brings delight to area fans who cannot attend this event. Nemeth was named Sales Manager in 196 and was able to tailor advertising packages to carry local sports for an entire season, with the station sports staff selecting the “best game of the week” to create the most interest. He has also traveled some in his sports announcer’s job. Besides covering the Wooster Scots games, wherever they go, he has gone with the Mt. Eaton Quality Block softball team to the regional and national tournaments and with the Orr Park team to nationals in Lake Tahoe, CA, Stockton, CA and Oswego, NY. Although Nemeth’s on air sports activities are limited to the College of Wooster games now, you can readily see his influence on the other announcers covering local play-by-play. His goal was to be as prepared as possible with statistics of both teams, players to watch or, particular offenses or defenses which might have a bearing. Then find the best way to “make the listener visualize the action…feel the excitement of the crowd…build the tension of the game…and fill in with colorful facts and statistics.” (Quote from Barbara Nemeth in nominating data). Our local station’s announcers carry on the tradition well. Nemeth is now general manager of the radio station he joined 32 years ago and makes his home in Wooster with his wife, Barbara, son Rob, and daughter Kendall.